I would like to thank Fit is a Feminist Issue and specifically Samantha (who shares my name) for the opportunity to write a guest blog post. 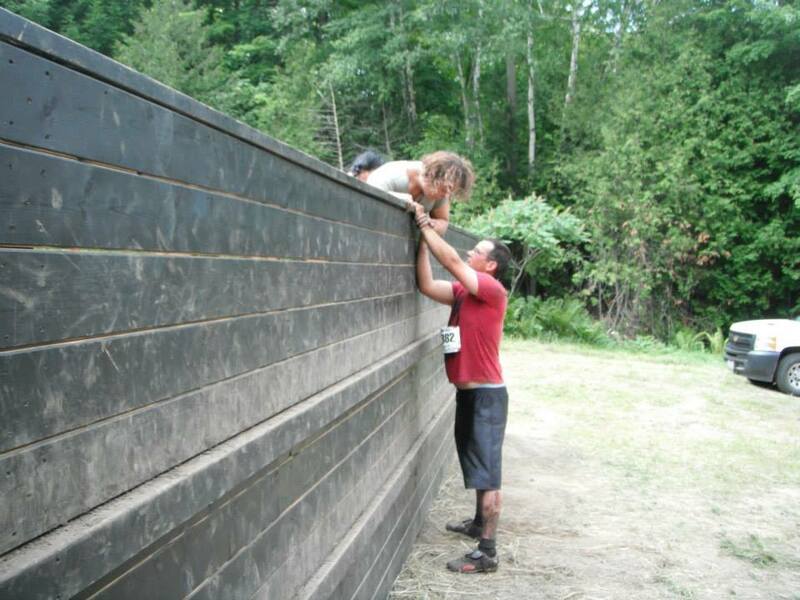 Recently I completed the Warrior Dash at Horse Shoe Valley, close to Barrie, Ontario, Canada. 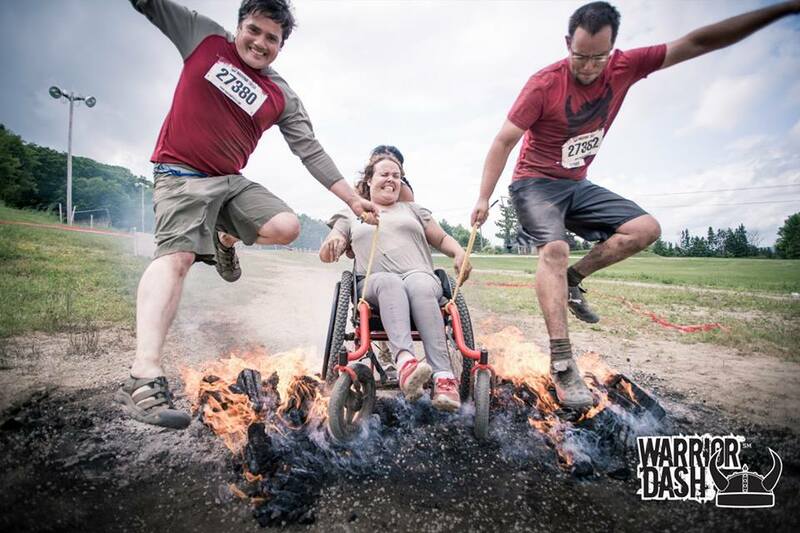 The Warrior Dash is a 5 km race with 12 obstacles. It is basically a mud run. (The blog’s Sam did it last year and you can read about her experiences here.) 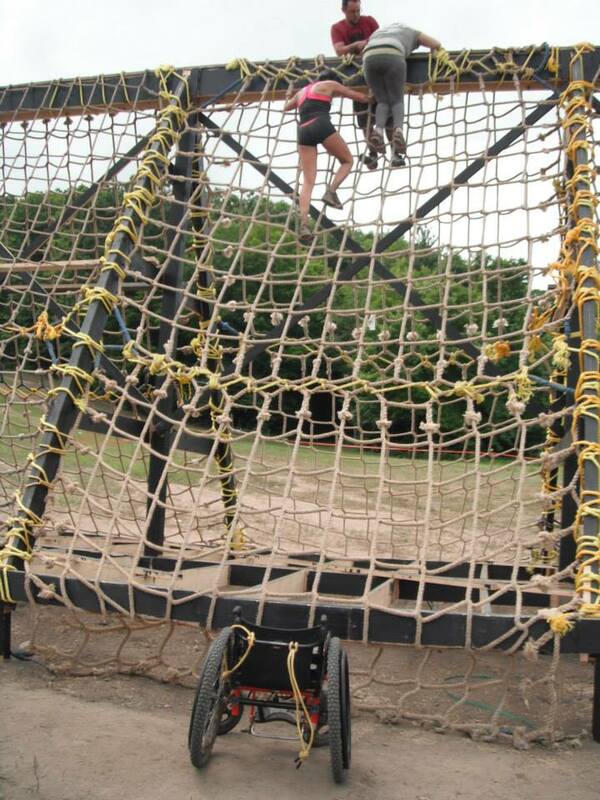 These sorts of obstacle courses are all the rage but are not typically frequented by folks who identify as disabled. I think the Warrior Dash and my experience of the event present a fantastic occasion on which to reflect on the notion of a “Warrior Dash,” who we expect in sports, and inclusion. This will be focus of my blog post. To begin here’s a little info about me: I am 30, I just recently changed jobs so now I work in a post secondary institution. However, I just left a position at a small non-for-profit (where I worked at the time of race). I am a doctoral candidate in Sociology. I also have a condition called cerebral palsy. It effects my coordination and ability to walk. I use a wheelchair to get around. It was a fluke I participated in the Warrior Dash. I am not a championship athlete; I have never been to the Paralympics. I don’t fit the “super crip” profile. I attend a cross-fit style gym but, even that is a laid back space of fitness and fun. Further to this, I understand disability to be largely socially constructed meaning. We as a society privilege and expect a specific kind of body and marginalize anyone who falls outside of that. For example, I cannot take the subway because it has stairs I can’t get my wheelchair down. The subway is built assuming everyone who uses it will be able to walk up and down stairs. This marginalizes my body as it dictates how I move about the city. For me disability is not something to be overcome or cured it is a social position which is largely a creation of social organization but, often positioned as an individual “problem” which is pathologized through medical discourse. So how did I end up in a Warrior Dash then? My co-workers Steven and Gretta had a flyer about the event. I commented that I would like to do that but figured you had to be able to walk. Steven and Gretta were pretty empathic that you didn’t NEED to be able to walk and they would help. For me this was fascinating; Steven and Gretta were insistent we could all problem solve and make it accessible. This was a new kind of access for me a new way to think about inclusion. The synergy and sheer will of the individuals involved were going to create space for me. This was different than my usual imagination of access which involves modify the environment rather than a social dynamic to include a different body. Ironically, preparing for the Warrior Dash did not involve intensive training but, more so a lot of e-mailing and a little bit of engineering. I contacted the Warrior Dash to let them know I wanted to do the race and see what their reaction would be? I found a man on the internet through Facebook (Chris Stoutenburg aka Stouty) who was disabled and had completed a similar race in Collingwood. 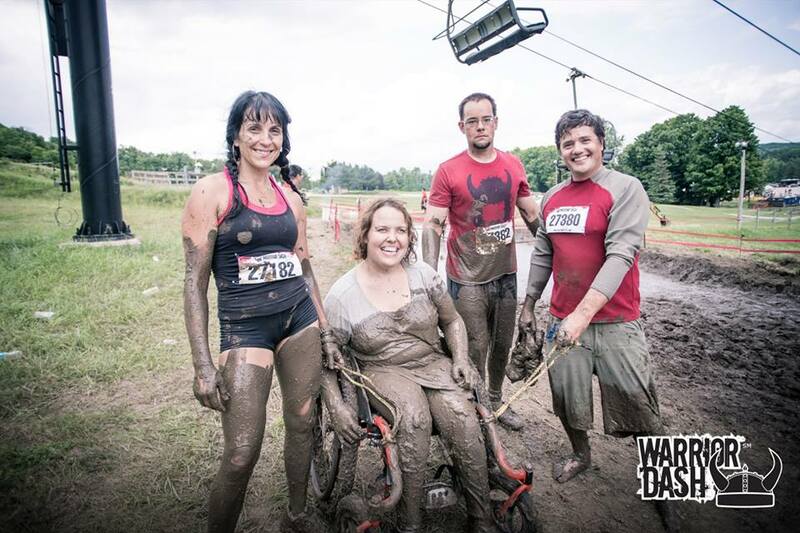 He used a manual All-Terrain Wheelchair and had a team who supported him through the race. I own an All-Terrain Wheelchair (my parents had gotten it for me years ago so I could keep up with friends in snow and mud. It retails for about $8000. It is understood as a recreational piece of equipment and is therefore not subsidized through the government). It all fell into place. The Warrior Dash e-mailed back and said that if I wanted to I could participate.They said I had the option of skipping obstacles that I felt I couldn’t do. They also said they had both competitive and recreational heats. I appreciated that they responded to me with the same approach they would of an able bodied runner. They listed facts and stats about their course. No one asked: “are you sure?”, “is it ok if you do this?” I was given the full dignity of risk to throw myself down a muddy hill just like everyone else. I was really pleased at this response. More often than I would like to admit when I attempt something new or risky I am grilled about safety; if I am allowed to do it (I am never sure who this overseeing body is: my parents, a doctor, some sort of God? ); or that the organization does not think it’s a good idea. I commend the Warrior Dash for having a “come as you are” approach. I do, however, wonder about the implicit privilege I have and if this is not the catalysis to some extent for my participation. I have a full time job that pays a living wage. The result of this: I have co-workers who invite me to run obstacle courses with them. The living wage insures that I have extra money to participate in recreational activities. Statistically folks with disabilities often experience higher levels of social isolation, and poverty, there is a 45% unemployment rate in Canada of folks with disabilities. I own multiple wheelchairs and pieces of sports equipment. A huge barrier to adapted sports is the cost of the equipment. Where as a good pair of running shoes may cost $100-$150. A sports wheelchair may cost at least $5000. In Ontario an “everyday wheelchair” is subsidized 75%. Of the cost through a government program; the individual must pay the other 25% but,that offers some support. In contrast adapted sports equipment (hand bikes, sports and camping chairs) are not subsidized, therefore recreation is often something only wealthy disabled folks can participate in. In my case my parents felt the benefit of the activity was worth the debt, so they often went without so I could have more. However, if what I have ever breaks or wears out, I can’t afford to replace it—someday the clock will run out on my sports participation too. Even, activities that require no special equipment like a gym membership come with a price tag. I love my gym but, I could not afford to be a member on a fixed income. I have body privilege I am disabled but, in a way that is easily adapted. I bear weight, I don’t often battle illness, and I don’t struggle with fatigue. There are many instances where the nature of my condition has allowed me to pass into a social space where other disabled people would not be able to go. I am educated, literate, and I have access to a computer. Access to meaningful education is still an issue for folks with disabilities. Literacy and access to alternative formats of texts is also an issue. I again pass because these are not my individual issues. Further to this I own a computer and have free time to search and ultimately stalk other disabled athletes to find out how they participate in obstacle courses. A myriad of factors caused me to be able to participate in the Dash but, a large piece was the intersections of privilege within my own identity and lifestyle. The Warrior Dash may have had a come as you are attitude but, if I was going to come I would have to bring my privilege with me. A New Type Of Inclusion: Power to the People Race Day! The day of the race came with excitement and success. It was decided we would tie ropes to the wheelchair so it could be pulled as well as pushed. Steven invited his nephew Dan. We would work together as a foursome. 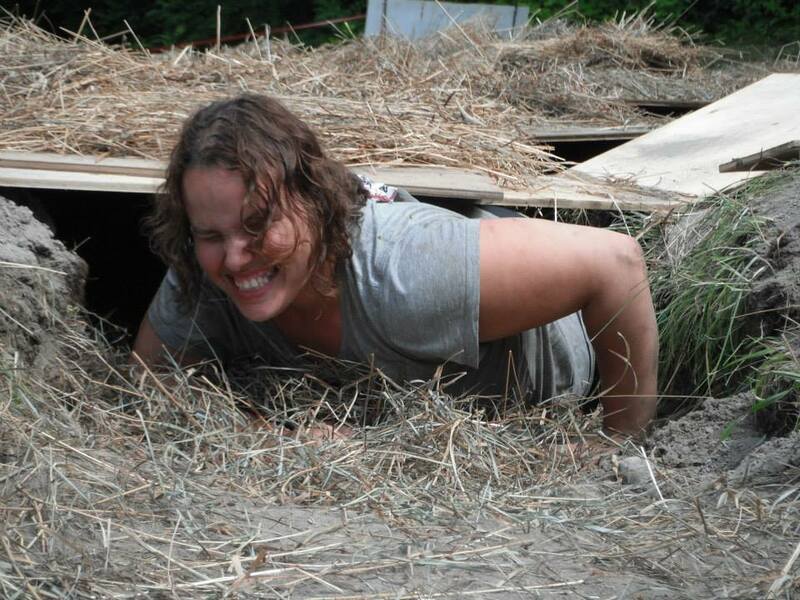 Together we traversed 5km of hilly terrain, and through 10 of the 12 obstacles including but not limited to: a 60 foot cargo net climb, crawling through a dirt tunnel, climbing over a wall, jumping (or wheeling) through fire and finally a mud pit swim. It took us approximately 3 hours with various other participants stopping along the way to lend a hand. I found the simpatico of my team to be really beautiful. I pushed the wheels, someone pushed the back of the wheelchair and 2 others pulled ropes. When the hill got to steep, I got out and crawled, and someone carried the chair. When someone got tired we all stopped. The focus was finishing as a unit, not speed. Each obstacle was met with strategy; each member playing a part in spotting me. The obstacle was finished when all of our members completed the obstacle. The question became not “can you do this?” but “how can you do this?” Together, we did things like creating human steps to get a boost up, pulling each other over obstacles and in some cases I was even lifted to where I needed to be. In the small world of our team exclusion was not an option, each situation would be manipulated to fit the abilities of the individual. The race was an amazing day. Every competitor we past or bumped into was supportive. The air was electric and full of fun. However, while everyone was supportive and excited, folks’ reactions to me were interesting (maybe it’s the Sociology background) but, I was fascinated. Many people with the best intentions of course stared or choose to comment on my participation. People called out things such as: “good job”, “I could never do that”, or “no excuses”. A few people stopped to ask “what my disability was” or “why we were doing this?” Often, folks directed these questions to the able-bodied members of my team. 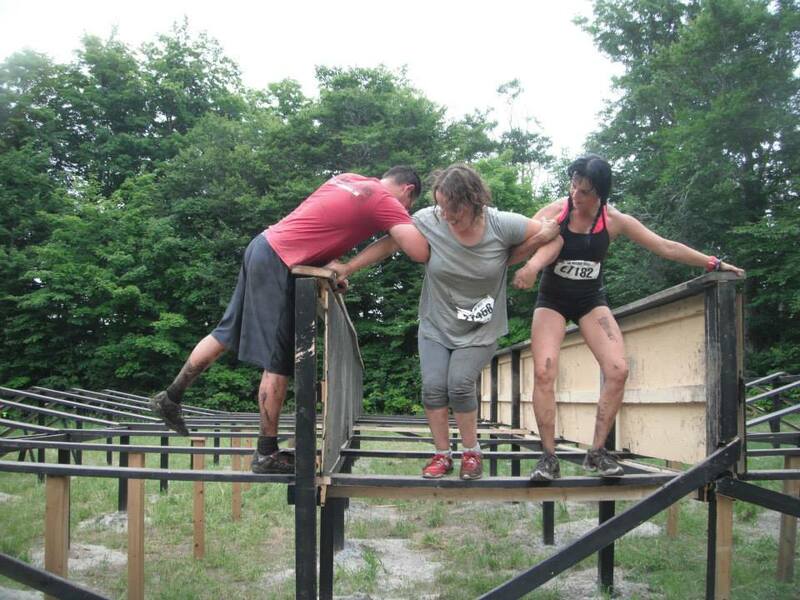 Moreover, people stopped to tell me I had good friends and or take pictures of us completing the obstacles. I understand that photos are part of this experience but, I was surprised at how many people were specifically taking photos of me and my team. There was much talk about overcoming and perseverance.When we crossed the finish line while there was cheering for everyone; there was cheering as if we had just finished the 100 meter dash at the Olympics. I found this really interesting because the people complimenting us and snapping photos seemed to understand my participation as both novel and a symptom of my own personal strength. I am fascinated by the common sense understanding that when disabled people are absent from a social space it is due to their own personal failing and when they make an appearance it is because of some specific inner strength. In actuality I would contend that my appearance at the warrior dash had more to do with my access to resources, as well as social and cultural capital. I am delighted that everyone was so positive and helpful because, I am sure there was a time when folks would have reacted negatively to a disabled person participating in such an event (much like when women were not allowed to run the Boston Marathon). I am troubled though about the lack of acknowledgement of the connection between class, privilege and disability. I think it is central to creating equity and inclusion in sport and greater society that we begin to recognize that these entities are linked and create barriers to folks participating. While I may scratch my head at the reasons people had for cheering me on; I certainly agree there was much to celebrate about that day. The simpatico my team created was/is a beautiful type of access which centered on the value of each person. We were able to create a symbiotic approach; that disrupted normative expectations and re-defined how obstacle courses are run and who runs them. We were total bad asses; we ran through fire! Who does that?!??!?! The completion of the dash meant we conquered: 5 km, 12 obstacles and had a million photos taken. All worth the celebration! I am grateful for the outside the box thinking of my team, and their amazing spirit. I could not have done it without them. A new experience and a new way to “do” inclusion. Who could ask for more? What a great account of your experience. I also like how simply you explain the social construction of disability and how the individualistic “overcoming” narrative fails to see that role that social structures play in creating disability. Thanks for guest posting and congrats to you and your team! Thank you for this amazing post! It speaks to a lot of my interests in the study of sport and sociology. I will definitely be sharing this story with some of my other friends in the field. And congratulations on your finish! I hope that a race like this is in my future too! I’m so glad I found this article. The organization I work for is giving away tickets and I wondered about the wording that people of all physical abilities can participate (I’ve never participated, so don’t know the setup). Reading about your experience helps me gain a better understanding. Thank you.